Knowing the basics of how we generate energy can be helpful in understanding how we fatigue. Once we know how we fatigue, we can train to minimise it. I will take you through this as simply as possible but I will have to use some “science-y” words when required. ANY muscle contraction is due to a molecule called Adenosine Triphosphate (ATP). When an ATP molecule is combined with water a bunch of chemistry happens and one of the products is energy. In order for further muscle activity we need to replenish the stores of ATP. Another product of this breakdown of ATP for muscle contraction is Adenosine Diphosphate (ADP). In time, more chemical reactions take place which convert ADP to ATP. Right. So we need ATP to get our muscles to work. Show me the nearest ATP shop! No so easy. Sadly. 3. Oxidative or Aerobic System (long duration, low power). IMPORTANT. All of these systems are available and “turn on” at the outset of any activity. What dictates which one (or two) is relied upon the most is the effort required. One would then assume that at the beginning of a dragon boat race we would want explosive power for a short duration. We would want both the ATP-PC and glycolytic systems to be in full swing. Take a long look at this graph. It holds the secret to your dragon boat performance. Firstly, you can see there is small amount of ATP (in yellow) stored in your muscles – about 2 seconds worth. You can also see that the energy systems turn on in a specific order and peak at different times. But they all contribute at some level all the time. The relative amount of energy that each system is providing will change with varying exercise intensity and duration. You will never be receiving your energy exclusively from one energy system while you are exercising, but from all three to different degrees. Just as important is the overall performance line (in pink). Observe how much energy you are producing at the beginning of your race? When the coach says that your race is won at the start, he is correct. You need to ensure you don’t waste any of that early energy. Exercise at high work intensity during which the muscles requires more oxygen than what the body can produce (aerobic capacity). 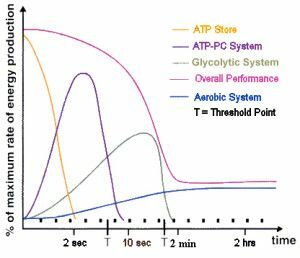 Instead, the muscles draw a significant percentage of their energy from anaerobic sources - the ATP-PC and the Glycolytic systems. Exercise, typically performed at moderate levels of intensity for extended periods of time, which maintains an increased heart rate. 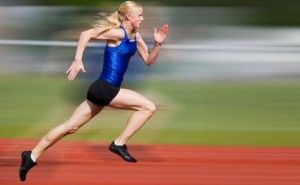 It is estimated that the anaerobic systems can be improved up to 20% and the aerobic system by a whopping 50% (in untrained subjects only). In order to get the most out of your energy systems in dragon boating, you need to target your training to improve BOTH your anaerobic and aerobic capacity*. 1. You need ATP to allow your muscles to work. 2. Your body has a small store of ATP in your muscles which lasts about 2 seconds. 3. Your body can manufacture ATP using three systems. 4. These 3 systems manufacture ATP at different durations and proportions. 5. What proportion each of the systems contributes to your ATP supply depends on how much muscle exertion your body is requesting. * Dragon Analytics will have these training modules available soon. I am currently trying to impliment to 10, 20, 30 technique during our training sessions, is this an example of using the 3 energy systems and is 10 minutes of this includ3d within an hour usual db training enough? Hope I am on the right track? By 10, 20, 30 technique are you referring to a race start (10 to get the boat up, 20 at a higher rate, 30 … etc.)? Or are you referring to bursts of 10 strokes at full power. Rest. Then 20 strokes at full power? etc. ? For most dragon boaters, the explosive part of a race start is around 15 seconds. This would mean that you are drawing mainly on the first energy system (ATP-PC Energy System). So any short, explosive training drill that lasts around 10-15 seconds would be conditioning this energy system. An energetic drill that lasts over 15 seconds to around 2 minutes will be drawing mainly on your second energy system. After about 2 minutes of vigorous exercise you will have exhausted most of the first two energy systems and now be in the third energy system (Aerobic) which puts out less power but lasts a lot longer. I would guess that most of your training would be conditioning the aerobic energy system. However, if you have bursts of intense activity then the other systems would be kicking in. So, at your training, all energy systems would be getting a look in. However, there are structured training drills that target each energy system, individually, to get maximum results. The next post in the series “Pass the Energy Please Part 2 – The ATP-PC Energy System” will be published soon and will outline what to include in your dragon boat training to condition this first energy system for more power and more capacity.